A cat colony is a group of cats without owners that have formed a community of sorts around a common food source. Some were once pets, while others have been born as a part of the colony and are feral (wild) after 2 to 3 months without human contact. Cats in unmanaged colonies face starvation, hypothermia and frostbite, disease, and death. Yet despite these factors the populations continue to explode as cats are allowed to procreate. The best way to help is to find people to act as caretakers for these colonies (providing food and access to adequate shelter), to remove any tame or rehabilitatable cats and kittens and find them forever-homes, and to provide spay/neuter operations to control the population. Local photographers give a voice to dumped cats in our county and beyond (because a picture really is worth a thousand words! 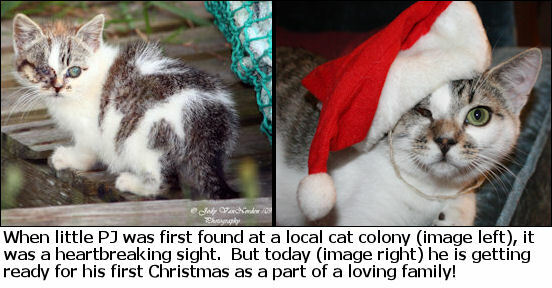 ); join them on Facebook to find out the sad truth about local cat colonies, and learn what you can do to make a difference! Help PET Projects to gather information about cat colonies in our county so that we can effectively petition local governments for assistance in addressing the need for Trap-Neuter-Return. Click here to file a confidential report of a cat colony! Help for Rescuers: If you have recently rescued a dog or cat that is in need of a forever-home, we can help! Help for Pet Owners: Learn the ins and outs of responsible pet ownership, including how to choose the right foods, the facts about spaying and neutering, teaching safe pet interaction to children, and much more! From here you can also find out how to access social services such as emergency veterinary care, spay/neuter subsidy, and emergency pet food and supplies. Lost and Found: Read or post community notices about lost and found pets, and learn steps to take to help reunite pets and their owners! Advocacy: Learn how to respond to animal abuse and neglect, learn what you can do to bring about change in the laws that protect pets, and find links about animal issues. Cat Colonies: Learn about the consequences and conditions of dumped cats in Shelburne County, report existing cat colonies, and find out what you can do to help! Resource Centre - Main: Helpful links and local contacts.